On Zulily today you can save up to 50% on gymnastics gear from Sports Gifts: Little Gymnasts. The above Tumblewear Pacific Blue Bree Rhinestone Leotard is only $29.99. 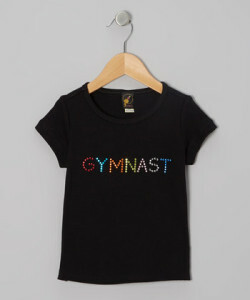 This great 3 Pearls Kids Black “Gymnast” Rhinestone Tee is only $14.99. 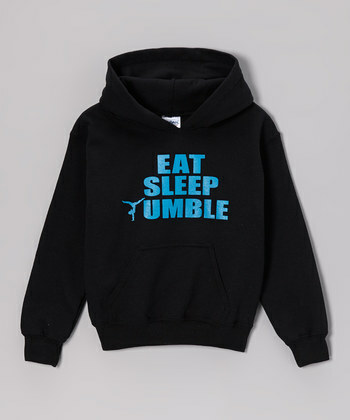 This Black “Eat, Sleep, Tumble” Hoodie is only $24.99. There is a large selection of leotards, shorts, shirts, hoodies and more to choose from and you really can’t beat the prices. Zulily is a flash sale/daily deals site catered to moms and children. It’s one of my favorite places to snag deals on gifts and items for my family and home. Are you new to Zulily? Sign up here and receive emails letting you know what is on sale.